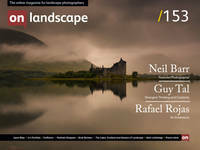 Whichever way you look at it, “Masters of Landscape Photography”, like “World’s Top Photographers : Landscape”, isn’t the most humble of titles. The key to understanding any list that tries to place a group of photographers on a pedestal is that the end result says more about the person choosing the list than the choices themselves. In the case of the “World’s Top Photographers: Landscape”, the story goes that in the UK, Charlie Waite was asked to pick a group of photographers that he thought represented the best in the UK and inevitably he chose people he knew and many he worked with (NB: I've gotten to the root of the story and it should have been Terry Hope that is credited with choosing the photographers, sorry Charlie!). The end result absolutely included some of the top photographers of the moment, Charlie Waite (obviously), Joe Cornish, David Ward, Colin Prior and Paul Wakefield but also some photographers that were perhaps not quite as good but happened to be people that Charlie had worked with or knew well. I believe the same happened in America (I’m guessing David Muench might have been asked as his son hadn’t been working long when this was commissioned and yet he was still included) where we had the likes of Galen Rowell, William Neill, Charles Cramer, Jack Dykinga, Tom Till, Jim Brandenburg, Art Wolfe but also a few lesser known photographers.